It is ironic that the BBC, the broadcaster that has done the most to advance the Brexit cause and continues to do so every day on its Today programme, should be the first out of the blocks in offering to host a debate on Theresa May's Brexit agreement. Unfortunately, their failure to challenge the Prime Minister's chosen format, other than to include audience questions, leaves them failing in their duty to provide balanced coverage. The idea that we should have a debate between a Prime Minister who was once a Remainer, but is now leading us out of the EU on terms that makes us 'rule-takers, not rule-makers', and a Labour Leader, who at heart is a Leaver, and whose main preoccupation is in getting a better Brexit deal (if that were even possible), is risible. Where are those arguing for us to stay in the EU in this format? For that matter, where are those advocating a 'No Deal' Brexit? The Brexit Broadcasting Corporation continues to form in limiting choices and restricting arguments. Surely such this proposed debate is contrary to their charter. Corbyn of course is playing hard to get. According to the Guardian, he is happy to take part in a debate that keeps the format as a head-to-head debate and excludes third parties, such as those proposing a second referendum. Of course he is. Such a format helps him to maintain the illusion that he is in opposition, when in fact he is sitting on the fence and, in many cases, actually aiding and abetting the Tories in their ambitions to leave the EU. Corbyn also apparently prefers to debate on ITV, presumably because this format does not involve audience participation and so limits the potential to challenge the Labour Leader on his pro-Brexit stance. He argues that he is keen to watch the final of I’m A Celebrity… Get Me Out Of Here! and that holding the debate on the same channel, just before that event, will guarantee a large and diverse audience. Personally, if that happens, I will be watching David Attenborough’s Dynasties on BBC1. Is it perverse of me at this point to draw attention to an incident during the last Labour leadership contest when Corbyn was presented with a picture of Ant and Dec and was unable to identify them? I am pleased that he has caught up with his popular culture since then. More significantly, Corbyn is also reputedly keen to use a Brexit debate to talk about wider issues such as the economy, education and the health service. If that were allowed to happen then both channels would be even more in breach of their guidelines in not producing balanced programming. Surely they would be forced to include other parties? More to the point, the fact that the Labour leader is even considering such an approach underlines his central argument that the best alternative to May's Brexit deal is a General Election. You cannot have a single issue election. May tried it in 2017 and failed miserably. In fact Ted Heath tried it in 1974 with similar results. The only feasible way to test public opinion on our future in Europe is through a referendum and, unlike the BBC and ITV, such a plebiscite should give us the choice of remaining in the European Union. When the M4 extension around Newport was first mooted we were assured that it could be delivered for less than £1 billion. Alas the inevitable has happened and according to this report on the BBC, not only is the cost now likely to spiral upwards to £1.7 billion, but there may well be a judicial review as well, which will add to the cost and delays. Of course the real cost of this misguided scheme is its impact on the environment. It is planned to infringe on five SSSIs and will compromise the mitigation measures that were put in place on the Gwent Levels to compensate for the loss of wildlife when the two Cardiff river outlets were enclosed by a barrage. There needs to be full and proper scrutiny of this scheme by AMs, but surely we have reached the stage where not only is it unaffordable, but unacceptable too. Like all new roads this extension will fill up with traffic within a few years, adding to pollution, and any gains in journey times will be lost. The investment that needs to be made is in public transport. The possible £1.7 billion budget should be more than enough to transform public transport options for commuters in South East Wales as well as those further west in my own area. The Welsh Government needs to be looking at that instead. Theresa May was in Llanelwedd yesterday at the Royal Welsh winter fayre to try and reassure farmers that her proposed deal with the EU will not adversely affect them. However, as this report in the Independent reports, there is a very real threat of cheap, low-quality goods entering the country and undermining home-grown food following our exit from the EU. Another threat that needs to be countered if we come out of the EU. We were told that Brexit was about taking back control and yet our economy and trade depend on finding partners, striking deals with them and in the process, ceding some of that control over the movement of labour and goods. Anybody who says differently is either lying or profoundly naïve. The UK cannot stand alone in an interdependent world dominated by multi-national companies. The logic of Brexit is that we should not be locked into a single free trade area, even if it is the biggest in the world, accounts for 44% of our trade and holds the key to thousands of jobs and to our financial services sector, which is our biggest export. The Brexiteers want to fish in what they think is a bigger pond. It is entirely a coincidence that a number of them have economic and business interests that may benefit from such a change in our trading arrangements. In this context, comments yesterday from Donald Trump are particularly disturbing. As the Guardian reports, he delivered a weighty blow to Theresa May’s hopes of steering her Brexit deal through parliament, saying it sounded like a “great deal for the EU” that would stop the UK trading with the US. Trump knows when he has the upper hand. If the UK leaves the EU we will have significantly less bargaining power, we will be desperately casting around for deals to compensate for the slump in our economy, and in doing so we will be negotiating from a position of weakness. Brexit is not about retaining control, it is about ceding control to the likes of Donald Trump and China, whose dominance in world trade gives them carte blanche to dictate terms to any country that finds itself isolated and friendless on its own continent. As part of the EU we can resist that. Outside the EU we are on our own. The Independent reports on the first proper analysis of the deal that Theresa May has negotiated with the European Union and it is not good news. The National Institute for Economic and Social Research (NIESR) estimate that the deal could leave the average person more than £1,000 worse off per year in the first decade outside of the EU. They say that the agreement could hit the UK’s economy by £100bn a year by 2030, equating to an average of £1,090 per person. They also warned that the government’s preferred outcome could see a 46 per cent hit to trade with the EU and a 21 per cent fall in foreign direct investment. The report said: “Our key finding is that if the government’s proposed Brexit deal is implemented so that the UK leaves the EU customs union and single market in 2021, then by 2030, GDP will be around 4 per cent lower than it would have been had the UK stayed in the EU. They add that if the UK remained in a customs union beyond the transition period, through the so-called Irish backstop, it would still mean a hit to GDP of 2.8 per cent a year, the equivalent of £70bn a year. The alternative of a no deal exit though, is worse. The NIESR say that the “orderly” no-deal, favoured by Brexiteers, would reduce GDP by 5.5 per cent, or £140bn a year. Of course, these calculations do not take account of the other downsides of this deal, that we will effectively remain part of the EU single market without any say over the regulations and laws we will now be subject to. That is not in the National interest. It is little wonder MPs are set to reject this deal and the no deal alternative. Will they grasp the nettle though and give the British people the option of choosing for themselves whether we accept the deal or stay in the European Union? One of the joys of Twitter is capacity for satire, parody and irony (if they are not all the same thing). When I holidayed in San Francisco some years ago I was very taken by one Twitter account which played on the fact that the Bay area, and in particular the Golden Gate Bridge is often shrouded in fog. Karl the Fog, provided regular updates on the weather in an amusing first person way that added to the experience provided by the City. 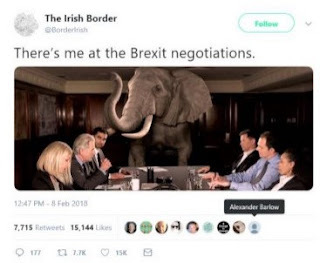 I am not so sure that The Irish Border twitter account is so functional, though it clearly has a relevance and purpose beyond the computer screen. “I dislike Brexit but, speaking as a border, I do admire its ability to completely divide a country,” it declared. It treats Boris Johnson – who was due to address the Democratic Unionist party conference in Belfast on Saturday – with disdain for the former foreign minister’s blitheness about Irish history. It mocks proposed “smart technology” solutions for a border which partitioned Ireland in 1922 and gradually became invisible due to Irish and UK membership of the European Union and the Good Friday agreement. It was due to speak to RTÉ radio on Saturday, its sentiments spoken by an actor. In an email interview with the Guardian, @BorderIrish declined to identify the person behind it but explained why it started tweeting. The BBC reports that the UKIP leader in the Welsh Assembly, Gareth Bennett, who spent almost £10,000 of public money on a damp office that was never used, has agreed to have his salary cut to repay some of the cash. AMs on the assembly's standards committee have recommended the UKIP group leader be formally reprimanded. But he will not be subject to the most serious punishment available - exclusion from the assembly. The move means that the aborted project to open a constituency office at the former Angharad's Nightclub in Pontypridd has cost the South Wales Central AM £7,009. He had already paid £4,533 in legal fees to get out of the lease on the property, which was riddled with damp, had no electricity on one floor and was in a state of disrepair. The AMs' decision followed the findings of an investigation by the standards commissioner Sir Roderick Evans which found Mr Bennett signed the lease on the office against solicitors' advice, without a survey and without seeing it himself. The lease was due to last until April 2021 but it was terminated in September 2017 after it emerged the cost of repairing the building exceeded the allowances available to AMs. The BBC adds that a total of £9,883 was spent in taxpayers money by Mr Bennett on the property, including £2,477 on building materials, after a lease was signed in March 2017. The commissioner was unable to fully ascertain what happened to the materials, the sum of which Mr Bennett is effectively repaying in his November pay, although he assumed some were used in the office. The conclusion of this affair has denied Wales of one of the more unlikely link-ups in political history. As the Western Mail reported in November 2016, Mr. Bennett had invited Donald Trump to the official opening of his office claiming that the two men had a lot in common. If he had thrown in a visit to the golf course at Celtic Manor the President may well have been interested. I live in the middle of a 20mph zone, but I have not seen much evidence of changes in driver behaviour other than in those streets where we have introduced traffic calming. That anecdotal conclusion is supported by a study by the Department for Transport which is reported in the The Times. Average speeds on affected roads dropped by less than 1mph after the lower limit was introduced. The researchers said it was possible that drops in speed would have been recorded even if the limits had not been introduced because of rising congestion and increased awareness about the risks of speeding. Most local residents supported the change, the study said. In all, 75 per cent backed the 20mph limits and very few said that they wanted a return to 30mph. There was also a “small but significant” increase in people cycling and walking, with five per cent of people travelling by foot more than they did when roads had higher limits. The study, which was commissioned by the Department for Transport more than four years ago, found little evidence that 20mph limits had a significant bearing on safety. Unfortunately, changing speed limits is not enough to improve safety records, especially around schools. If we do not also put in physical measures and enforcement driver behaviour will remain unchanged. It is a lesson that local councils need to take note of. The Guardian reports that the official pro-Brexit campaign group has lost a judicial review aimed at trying to get an Electoral Commission ruling that it breached spending limits thrown out. Vote Leave was fined £61,000 by the watchdog in July and its accounting officer, David Halsall, was referred to the police for further investigation. At the time, Matthew Elliott, the former chief executive of Vote Leave, claimed the commission had not followed due process in its investigation and that it was driven by “a highly political agenda”. Bob Posner, the commission’s legal counsel, in turn complained that Vote Leave “resisted our investigation from the start, including contesting our right as the statutory regulator to open the investigation”. Fronted by Boris Johnson and Michael Gove, Vote Leave was accused of submitting incomplete and inaccurate spending returns, and of channelling donations it had received to the smaller BeLeave group which it worked with “under a common plan”, meaning its true spending was £450,000 over the £7m limit. The credibility of Vote Leave on this issue remains in tatters. Meanwhile those who fronted their campaign and supported it remain in Government, holding high office. Which Taxpayers do the Taxpayers' Alliance represent? Just who do the Taxpayers' Alliance represent? It is a question that has been asked on many occasions. In particular, where do they get their funding from? Some of these questions are answered in this article in the Guardian, which reports that despite claiming to be an independent grassroots campaign representing ordinary British taxpayers, the Alliance has received hundreds of thousands of dollars in foreign donations. They say that the Taxpayers’ Alliance has received at least $286,000 (£223,300) from US-based donors in the last five years, including $100,000 originating from a billionaire-founded religious trust incorporated in the Bahamas. Any group funded in this way cannot credibly claim to represent 'ordinary taxpayers'. These revelations raise serious questions about the way that the media treat this organisation as well as its influence on government. They are a lobbying group with a right wing agenda and should be treated as such. The article also adds to concerns about the influence of foreign money on UK politics. It is not just Russian money that is infiltrating the system, but American cash as well. And who knows to what extent this funding has circumvented rules against overseas money during elections and referendums? The need for a full-blooded inquiry is growing ever more urgent. Are the DUP trying to collapse the UK Government as well? If any of the money promised for Northern Ireland as part of the deal with the DUP has not been paid over yet, then the Treasury needs to seriously consider cancelling the payment altogether. Voting in the House of Commons last night clearly showed that the DUP have walked away from this agreement and are actively engaged in undermining Theresa May and her government. Having brought down the government in Stormont due to their intransigence Arlene Foster's party are now trying to do the same to the UK. Those of us who have studied history will remember the extreme measures that Unionists were prepared to take to sabotage efforts to bring Home Rule to Ireland. This included inciting mutiny in the British Army, an offence which should have led to prison sentences or at times of war, summary execution, but was allowed to pass unpunished. I am sure that modern day unionists would not even consider such measures, but they are clearly trying to get their pound of flesh and, unlike Shylock, they don't care if blood and other entrails come with it. Frankly, a confidence and supply agreement with these people was never going to work at the same time as the UK Government is negotiating our exit from the EU. The DUP do not seem to care if the Good Friday Agreement is wrecked and violence returns to their own backyard. They are a party with minority support, even in Northern Ireland, who are used to getting their own way irrespective of the consequences. It is time they were put in their place. One other question arises from last night's voting however. As the Independent reports, all eight of the party's MPs present in the Commons abstained on three votes, and even joined forces with Labour to support one amendment relating to child poverty. Despite that, the Labour amendment failed because the so-called official opposition could not get all its MPs into the lobbies to support it. According to Hansard, one of the absent MPs was Jeremy Corbyn. As a result an opportunity missed to defeat the Government on a key policy. Vince Cable took enough stick for his absence on a vote over Brexit, perhaps Corbyn deserves similar opprobrium for not showing up last night. By far the most remarkable interview over the weekend was that on Sky News between Sophy Ridge and Jeremy Corbyn. As the Guardian reports not only does the Labour Leader appear to believe that the UK can get the same benefits outside the EU as inside, a view debunked by two years of detailed negotiation and every statement by an EU leader, but he continues to stick to his pro-Brexit line despite the clear downsides of such a position. The idea that Labour can somehow get a better deal than that delivered by Theresa May is both unevidenced and not credible. Why would the EU negotiators roll over on their red lines just because they were faced with a different Prime Minister? What even would Labour do differently? They have not told us. Their six conditions are an argument to stay in the EU, something they refuse to acknowledge. And on the way forward, Corbyn declined to support calls for a second referendum, insisting that it is an option that can only be considered in the long term, and incredibly said that if there was another referendum, he did not know how he would vote. What sort of leadership is that? He is meant to be in charge of the opposition, not cheer-leading for the Tories. Anybody looking to Labour to take the lead in opposition to Brexit, or even in calling for a referendum on the final deal with remain as the alternative, needs to look elsewhere. They are not coming to that party. The only UK Party that has consistently fought for that rethink is the Liberal Democrats. We are providing the leadership that Labour appear to be incapable of giving. I've been sat up in bed for hours, whisky on the bedside table, soft jazz playing in the background, trying to think if I've ever worked with a more idiotic bunch of self centred bastards in my nearly 50 years as a MP. Nope, still can't think of any. Time for another bottle. However, in her apparent naivety the arch-Leave MP for Mid Bedfordshire has hit upon the major flaw of Theresa May's Brexit deal and of the whole Brexit agenda. As the Independent reports,the Tory backbencher, who campaigned tirelessly to get the country out of Europe, said Ms May's deal would leave the UK without any influence in Europe. Author – and Remainer – JK Rowling was somewhat more succinct. She tweeted an emoji of a head exploding. As the Independent says, it is not the first admission to make voters wonder if leave-supporting politicians knew exactly what they were campaigning for during the referendum. Just last week, leave voter and ex-Brexit secretary Dominic Raab let slip he “hadn’t quite understood” how heavily UK trade relies on the Dover-Calais Channel crossing. Nadine Dorries then made an attempt to clarify her remarks. In a Tweet posted on Saturday evening, she said the proposed deal was “worse than what we have now where at least we have a seat at the table and can fight our corner”, which is precisely the point. In just a few sentences, this MP has summed up everything that is wrong with the leave project. It is badly thought out, its proponents do not understand its consequences nor do they have a plan to make it work, it leaves the UK worse off than before under any of the many scenarios we might want to play out, and even when we have a deal (and one that accommodates all our other obligations like the Good Friday agreement) we find ourselves having to conform to standards, regulations and conditions belonging to other countries, just so that we can continue to trade with Europe and protect jobs, without any say in how those regulations are framed or what they say. That applies both with a deal and without a deal. For those who are starting to see that we may as well stay in the EU where we at least we can fight our corner, protect jobs and exercise our veto if necessary, then welcome to the club. Brexit has led us down a blind alley full of muggers. We have to turn back. It should now be up to the people to make that decision in a new referendum, where we at last have all the facts in front of us and can make an informed choice of taking the deal or staying in. Those of us who are members still recall how Liberal Democrats peers rallied behind the party's election guru and former Chief Executive, Chris Rennard over a number of allegations made against him. He was cleared of sexually harassing Liberal Democrat party workers despite an independent review finding “broadly credible” evidence he “violated” the personal space of women. A lot of the arguments deployed in Rennard's defence revolved around burden of proof, but the overall impression the case left with many of us was that, despite the findings of the independent review, the party's inadequate processes had failed the alleged victims. A new disciplinary and complaints procedure has now been put into place in the Liberal Democrats to create a proper process which treats all parties fairly, but also moves the burden of proof away from a criminal standard to one more appropriate in determining whether somebody should remain a member of the party or not. 'Jones said she was dismayed by a debate in which a series of peers said they were long-time friends of Lester and cast doubt on the veracity of Sanghera’s claims, which were supported by testimony from six people. Personally, I am appalled by the whole tone of this debate and by many of the things that were said in defence of Lester. They underline once more how out-of-touch and unfit for purpose the House of Lords is. The sooner it is replaced with an accountable elected second chamber the better. As May clings on, where is Corbyn? Coming back from a meeting in mid-Wales yesterday, whilst trying to digest the ever-changing news, resignations and Prime Ministerial statements, it felt very much like the country is going to hell in a handcart. To be frank it does not feel much better today. The deal that Theresa May has negotiated is massively disadvantageous for the UK, and yet it is the best she can possibly get under the circumstances. It was always going to be this way. No matter what Brexiteers like Boris Johnson, Michael Gove, Jacob Rees-Mogg, David Davis and their pals think, there is no better deal on the table. Either they misled us or they were deluded themselves. This has nothing to do with the intransigence of the EU, and everything to do with the unrealistic expectations of those advocating leaving. You cannot leave a club and then expect to retain the benefits you enjoyed prior to your departure. I am pleased that Theresa May hinted yesterday that not leaving the EU was an option but we have a long way to go before we reach that point. The big question though, in the midst of all those Ministers and MPs throwing their toys out of the pram, is where was Labour in all this? Their six conditions for supporting a deal are as unachievable as any fantasy that Rees-Mogg can dream up. They are in fact six reasons for staying in. And yet Corbyn not only refuses to acknowledge this but actively promotes the idea of a General Election as their priority, so that Labour can negotiate a better deal. That position is as self-serving and as irresponsible as anything that Boris Johnson has come up with. It maintains the fantasy that there is such a thing as a good Brexit and in doing so effectively emasculates Labour as an opposition. He is shoring up Theresa May when he should be leading the calls for a complete rethink on Brexit, even a referendum on the final deal. In the midst of all this chaos it is time for Corbyn to get off the fence, finally acknowledge that Brexit is dead in the water and support calls for people to be given another vote on the issue. The most important consequence of Theresa May's Brexit deal has nothing to do with her future as Prime Minister nor even that of the Tory Party, it is the consequences for the UK. We find ourselves in the worst possible situation, effectively in the EU without a voice. It was an entirely predictable outcome and one that many of us warned about before the referendum and since. Quite simply it is impossible to disentangle the UK's economy from that of our European neighbours without significant and quite possibly disastrous consequences. Any politician who says differently is either misleading us or has come from another planet. And that is my biggest problem with the Brexiteers and, of course, with the DUP who along with some of their more extreme friends in the Tory Party seem determined to wreck the Northern Ireland peace process in pursuit of the unattainable. But what of the DUP? According to this article in the Independent, they are being frozen out. The Prime Minister has finally woken up to the fact that they are no friends of hers. They are driven mostly by self-interest, not that of the UK as a whole. The paper says that civil servants have been told to remove DUP contacts from planning emails which the Northern Irish party would previously have been looped into. It also emerged on Wednesday that the Prime Minister had still not spoken to the party’s leader about the draft Brexit deal and it was unclear if she intended to do so before the document was published. The agreement between Theresa May and Arlene Foster is effectively dead and buried, another casualty of Brexit. That leaves only one item of business for the two parties - can we have our money back please? I have stopped watching Question Time on the BBC, I have too much respect for the safety of my television. Last night as Brexiteers lined up to condemn Theresa May's deal as a sell-out, the red mist descended again. I hadn't felt that way since I last dived for the remote control as David Dimbleby introduced Nigel Farage for the nine thousandth time. Brexiteers like Boris Johnson who had made promise after promise about taking control just under two and a half years ago, who had offered us £350 million a week for the NHS and trade deals galore, and who ignored warnings that any future deals would tie us in as mute partners to regulations and rules they were railing against, are now chewing on their own dust. They were wrong on every single point and they cannot stand it, so what do they do? They blame others and rail against the inevitable as if none of it were their fault. Why did they think that the EU would abandon their own interests to accommodate their little Englander positions? Why did they believe that peace in Northern Ireland should be abandoned in pursuit of their ambitions? How can they have been in key positions in government for much of these negotiations and wash their hands of the incompetence and the infighting that has left the UK an international laughing stock? So down they came, to a hastily arranged news conference of sorts, to fire the starting gun on what already looks set to be the most shameful chapter of the Brexit story so far. Which is the people whose utterly shameless lies have landed the country in this unimaginable mess, seeking to put as much distance as possible between their actions and the inevitable consequences of them. Several weeks ago, Mr Rees-Mogg called the TV cameras to a Committee Room in the Commons, where he waved about an utterly risible document described as the “World Trade Deal.” In the morning he’d claimed that crashing out of the EU with No Deal and trading with the rest of the world on WTO terms would be worth “£1.1trn” to the UK economy. By lunchtime, he’d said he had no idea if that claim could possibly be true. Faced with a choice between reality and taking ownership of his own outrageous lies, it is no surprise the latter should find itself beyond the pale. Next there was Boris Johnson, to announce that, “This is just about as bad as it could possibly be.” And he’s right. There will be no bumper weekly payout for the NHS. There will be no bonanza of free trade deals, with America, with Australia, with New Zealand, India, China, Canada and everybody else, because most of those countries have already objected even to the terms on which Britain is seeking to re-join the World Trade Organisation. There is just reality, a concept which, being the identical twin of the truth, Boris Johnson has never made even the faintest acquaintance. If he thinks this is a failure on Theresa May’s part, there was, of course, not even a moment’s pause to reflect on whether any of it could be his fault. Not even whether it is his more than two decades worth of lying about the European Union finally coming back to haunt him. Theresa May, perhaps, might have fared better in these negotiations had she not lost her majority at the last general election. Whether she might have done better in that contest if her most high profile minister at the time had not spent the last year as a walking advert for government by rolling embarrassment is a question there is barely time to consider. Some of us have been saying for years that because of the multi-national nature of trade, our dependence on the EU, and the difficulties of forming trade agreements elsewhere, then if we do not remain in the single market the UK economy will crash badly. The situation with Northern Ireland left the UK Government with no choice but to acquiesce to that logic. Where is the official opposition in all of this? Tom Peck is absolutely right when he says that Jeremy Corbyn, that supposed man of great principle, will not stand in the way of anything that might return him to Downing Street, whatever the cost. Boris is right, this deal leaves us subject to EU law without any power to change it. How else did he think it would turn out? The logic now is indisputable, we must stay in the EU so that we can at least exercise our veto if needed. If Parliament cannot determine that then the people must be given a chance to have their say. I have long argued on this site that the UK Government's obsession with culling badgers is contrary to the science, and that all the evidence points to the fact that the methods they have adopted are potentially cruel, ineffective and unnecessary. It is gratifying therefore to find some support for this point of view in an independent review commissioned by the environment secretary, Michael Gove. The report's authors have concluded that frequent trading of cattle and poor biosecurity on farms is “severely hampering” efforts to tackle the crisis of bovine tuberculosis in England and that it is wrong to blame badgers as the main cause of the outbreaks. The scientists say it is “highly desirable” that the government move from culling to the vaccination of badgers. The new report is highly critical of both farmers and ministers. Poor use of measures such as secure fencing to prevent TB transmission on farms is “severely hampering disease control measures”, it concluded, as are the 2 million movements of cattle every year as they are bought and sold. Clearly it is time for the Government to end this cull and invest resources both into vaccinating badgers, but also in developing a digestible vaccine, introducing stricter controls on cattle management and movement and to keep working on a vaccine for cattle. It would also help if government ministers stopped making misleading statements about the cull allegedly 'delivering results'. That is clearly not the case and the data in this report supports that view. By far the most far-reaching consequence of the admission by rightwing pressure group the TaxPayers’ Alliance that it illegally sacked the whistleblower, Shahmir Sanni for revealing unlawful overspending in the Brexit referendum campaign will be on the way that the so-called BBC deals with groups like this in the future. As Carole Cadwalladr writes in the Observer, the Taxpayers' Alliance has accepted all the allegations Sanni made during his action claiming unfair dismissal, wrongful dismissal, direct discrimination and “dismissal by reason of a philosophical belief in the sanctity of British democracy”. Sanni had claimed that it was responsible for a smear attack published by the website Brexit Central, and that it coordinated “derogatory statements” made by the head of Vote Leave, Matthew Elliott, to the BBC – calling Sanni a “Walter Mitty fantasist” and “so-called whistleblower” and claiming that he was guilty of “completely lying” – before an official finding by the Electoral Commission into the conduct of the Brexit referendum. The disclosure is likely to have far-reaching consequences for the way that broadcasters describe lobby groups. The uncontested claim has stated that the TaxPayers’ Alliance is responsible for Elliott’s Brexit Central website as part of nine “linked” high-profile rightwing “thinktanks” that operate in and around offices at 55 Tufton Street in Westminster and coordinate media and other strategy. In Sanni’s case, they also coordinated with Downing Street. That the BBC, in its misguided attempt at impartiality, has been culpable in facilitating these smears by continuing to provide a platform to a group of lobbyists whose funding and whose relationship with the UK government is shrouded in mystery, is a disgrace. For too long, the BBC has been giving credibility to fringe groups in the name of 'balance' without properly weighing up the facts on either side of the argument or properly evaluating the motives of the organisation it is giving a platform to or whether its claims to speak on behalf of a particular group is correct or not. Their idea of balance is a form of lazy inertia, and their failure to ask the hard questions do a disservice to licence payers. It has been evident for some time that the Taxpayers' Alliance is a right wing lobby group that is neither funded by taxpayers nor speak on their behalf. Why then do the media continue to give them credibility? Surely that must now change.